My latest pallet project involved our pool. 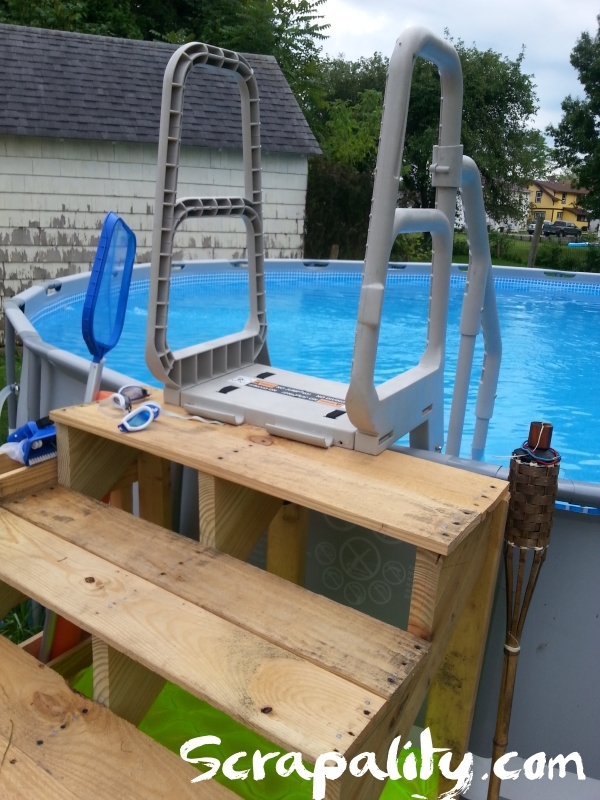 We were lucky enough to find a ladder for our pool with steps on the inside at a garage sale in our town. I was super excited and it was a fantastic deal. The only downfall was the movement of the ladder when someone entered the pool. It would move inward each time someone would enter the pool. That’s not a huge deal, but if everyone is in the pool, it made it difficult to get out. Plus, my hubby suffered a stroke a month ago which makes climbing a ladder out of the question. So, what’s a girl to do. 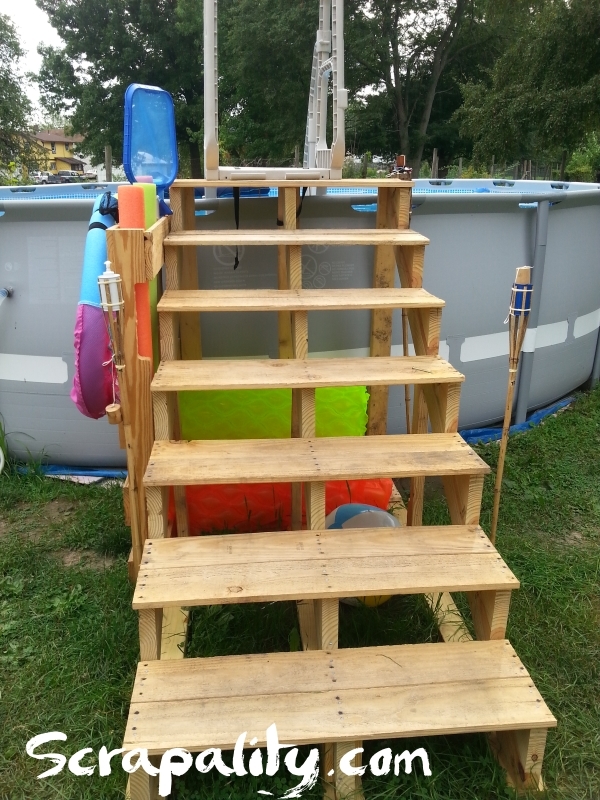 I built the steps high enough to allow the inside steps to be attached to the top of the outside steps. I had to cut my own stringers because Home Depot doesn’t carry a 7 step stringer. Bummer! Some of our floats and our beach ball fit neatly underneath. Who doesn’t love storage? I attached a pallet to the side of the steps for added noodle and tool storage. Are you loving the new stairs and storage? I’m hoping to add a railings and stain the stairs sometime this week. That is if I can keep the kids out of the pool of course. As soon as the railings are up, I’m hoping to convince my hubby to take a swim. It’ll do him some good. This post was shared with a few amazing parties. Awesome! 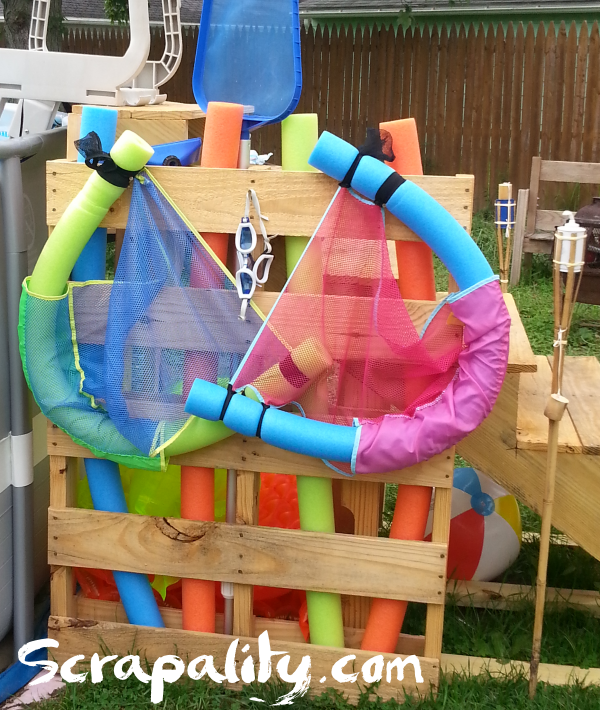 Love the pool noodle storage too! Thank you for sharing your project with us at Brag About It! What a clever project! 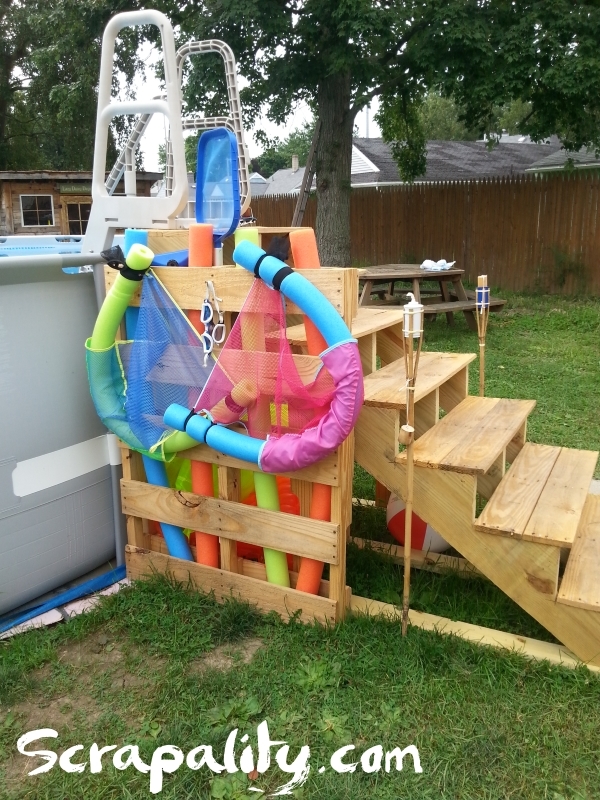 It’s just amazing what you can build with pallets. I love the storage – never have enough storage! Hope your hubby gets better and enjoys a swim. Stopping by from Too Cute Tuesday. Have a great day! I can’t wait to get him in the pool. It’ll be so good for him. I like be a good repurpose, and this is a great one, can’t wait to see the tutorial! Thanks so much! It was greatest fine but they move to much for me even with sand weights inside. But after attaching them to the wooden steps they stay put. Good luck with yours, hope you enjoy them. this is genius all around. i hope your hubby is able to use it easier, too. you could even make a railing if needed, sometime. Thank you! I’m planning on adding a railing to both sides to make it easier for him. Who can never have enough pool noodle storage, right? 😉 Pool toys have got to be one of the hardest things to store. It looks like you’ve come up with a great solution. I agree….this is flippin genius. I will make some of these next year. I hate my noodles laying around the yard and these steps are so much better than the ones that come with them. This will be my fav link from last week’s Teach Me Tuesday linky party. You will be featured at this week’s party starting tonight. Thanks so much for linking up with us. You are definitely the queen of pallet projects. This is such a clever idea! Thanks for sharing with SYC. That is a smart idea! Thanks for joining Home Sweet Home! Pinned!! I am so thrilled to have found this. 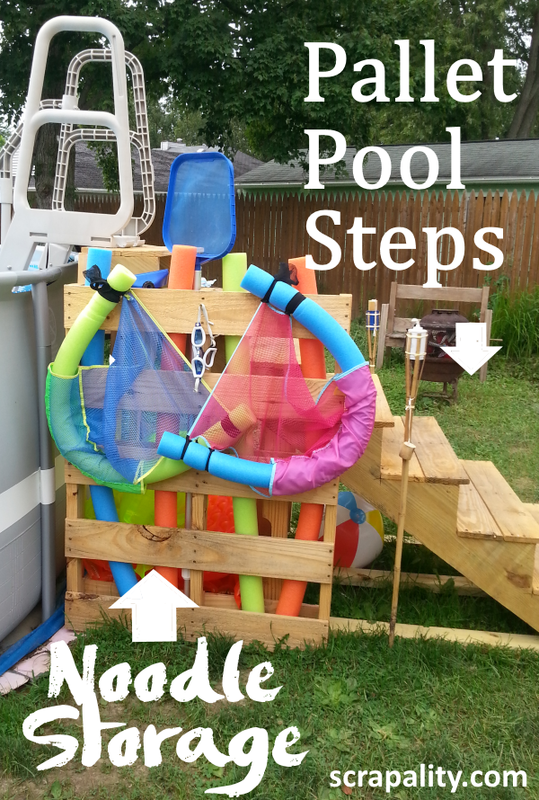 I have been looking all over Pinterest for something small, just for us to attach our ladder too, to get in and out of the pool. We had a deck built half around and the ladder attached to it. Well, after years and years, the wood was rotting, even though we used pressure treated, things are made like they used to be. Anyways. We decided no more decks, and just something like this. I had it in my mind what I wanted, but couldn’t get my husband to understand. 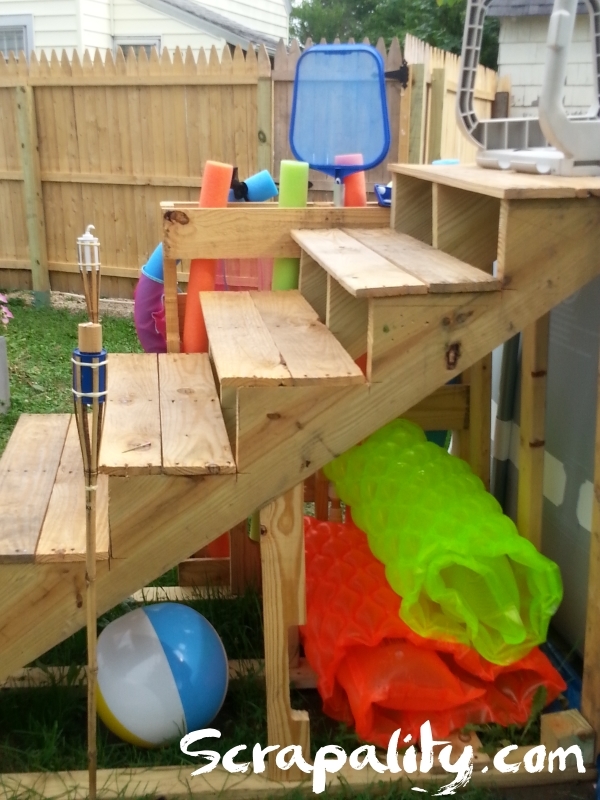 (a big set of steps attached to the ladder) You did a fantastic job, and I love the added side storage! Thank you!!! Just stopped by to let you know that I featured this on my Round Tuit post this week!